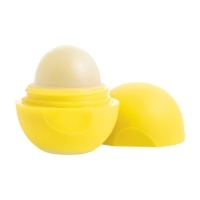 EOS Smooth Sphere Lemon Drop Lip Balm SPF15 is a protective and pampering lip balm which shields the lips from sun damage. Bursting with natural refreshing flavours of Lemon, Smooth Sphere Lemon Drop Lip Balm SPF15 offers broad spectrum protection against UV damage and has a Petrolatum and Paraben free formula which is water resistant for up to 80 minutes. Shea Butter and Vitamin E work harmoniously to soothe and nurture the lips whilst the transparent formula glides effortlessly onto the lips to create a luscious veil of moisture and protection.